Pinkadots Elementary : Freebie: Current events, Informational Text, Note Taking, and Speaking skills! Motivation Linky! 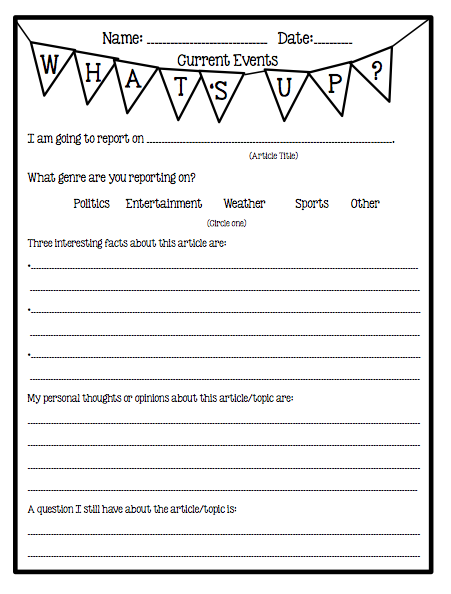 Freebie: Current events, Informational Text, Note Taking, and Speaking skills! Motivation Linky! I was inspired last weekend by a new app I came across on the educational freebie page. 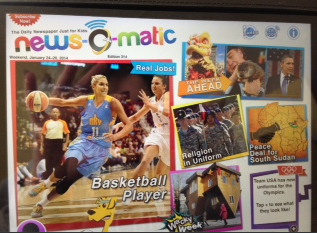 It is called News-O-Matic. It is absolutely perfect for the classroom and I am still shocked it was free. It is a daily newsfeed for kids. It highlights multiple genres per day from sports to politics. It breaks down news stories into kid friendly language and interesting topics. The stories are obviously true extremely interesting. The app is full of games, contests, ways to write to the publisher, and even past articles. I let students work by themselves, in partners, or in groups to read the current events on the app. They were then responsible to fill out the worksheet together and be ready to report to the class at our morning meeting. This turned out AMAZING for so many reasons! A few students started with iPads, but once others arrived they quickly unpacked and went to join a friend or group. EVERYONE was engaged and actively reading informational text. There were interesting articles for everyone from sports to politics. Kids were actually discussing and coming to a consensus in groups as to what to write down on the paper before sharing it with the class. The questions that the students came up with on the sheet were amazing! Many of them sent them in to "Russ" on the "Write to Russ" section. As you can clearly tell the students were motivated, eager to learn, and enjoyed reading the news. Who would have thought that the shy little boy that struggles with reading and writing would ask to work alone and present his thoughts to the class on "Working for Peace in Syria??" Turns out he is really interested in promoting peace and what the United States can do to help! I was blown away with his enthusiasm and background knowledge on the topic. When the groups presented to the class we reflected the app on the SmartBoard and everyone learned together. Seriously, it was amazing experience and the kids are already asking if we can continue this new idea next week! Try this out! I guarantee you and your students will learn from this app. This quick activity hits so many standards for CCSS and CCR that I do not feel guilty giving up 10-15 minutes a day for this new learning. Happy Saturday! I am off the grocery store! I am totally trying this! This is a fabulous idea!!! Thank you so much for sharing. What is the max you allow on one iPad? Does everyone fill out the sheet during morning work or just the group? Come Visit Me at Readbox!!! Awesome idea and app! I love it! Unfortunately, we only have one set of iPads at our school, so each grade level gets them for one week. But...guess what app I'll be using the week I get it???? I can't wait! Thanks for sharing a super motivator Theresa! Presumption like that not then is followed BUSINESS MUT up with closing eyes and ear with interest places forward commercial factor than social. The site has been designed to meet the needs of visitorsmayo boys school who have an educational problem bogging them. I read this article. I think You put a lot of effort to create this article. east delhi top 10 school I appreciate your work.